Last week I was talking with my husband about our respective ages and I couldn't believe that I would be turning 35 in a few months! I had to do the math in my head just to confirm that this number was indeed correct. Where did the time go? How have I been in my 30s for just shy of five years now and how is it that I am therefore now only five years away from being 40?! The years sure do fly by in a blink of an eye, which brings me to my "blogiversary". Yes, Hello Katie Girl turns four today, which is hard to believe. It's hard to imagine that I have stuck with blogging for four years. In fact, it's hard to imagine that I started blogging at all! Usually for my "blogiversary" I go all out and feature some of my favorite outfits or posts of the year or something reflective like that, but this year I am going to be a little lazy and just post one of my favorite skirts that happens to have been purchased the year I started blogging. In fact, I think I bought it a few weeks after I first started to blog. I purchased this skirt from eBay and it is actually what I would classify as "vintage" Kate Spade. It's an oldie but a goodie, and although it fits a little bit more snugly on me than it did four years ago, I hope to be wearing it in another four years. So who knows? Hopefully, next year at this time I'll make it to year five of blogging. To celebrate the big five maybe I'll do something a little more creative and special, but for today I think celebrating a favorite skirt (even though I have a lot of favorites as my regular readers must know my now), four great years of blogging, meeting many great online friends, and sharing my love of fashion and a few other randoms things will have to suffice! Happy blog-iversary Katie!! 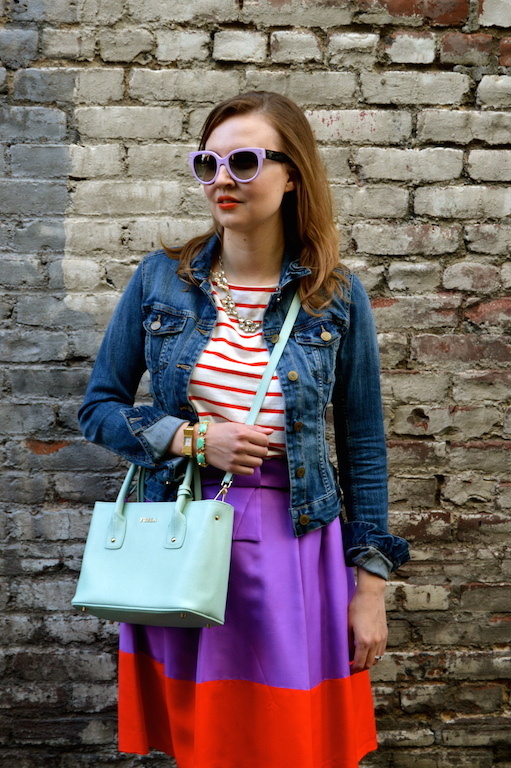 I'm only sad I didn't find your blog 4 years ago :) That is such a fun skirt and pairing it with a denim jacket and stripes is pretty much my favorite way to style a skirt, ever. Here's to many more years! Yay, Katie! Happy Blogiversary!!! You look gorgeous! Time does fly indeed, but you're making beautiful use of it. Happy blog-iversary! I've only found you a few months ago and I love your style. Happy Blogiversary, Katie! I am glad you started your blog four years ago because I love your style. 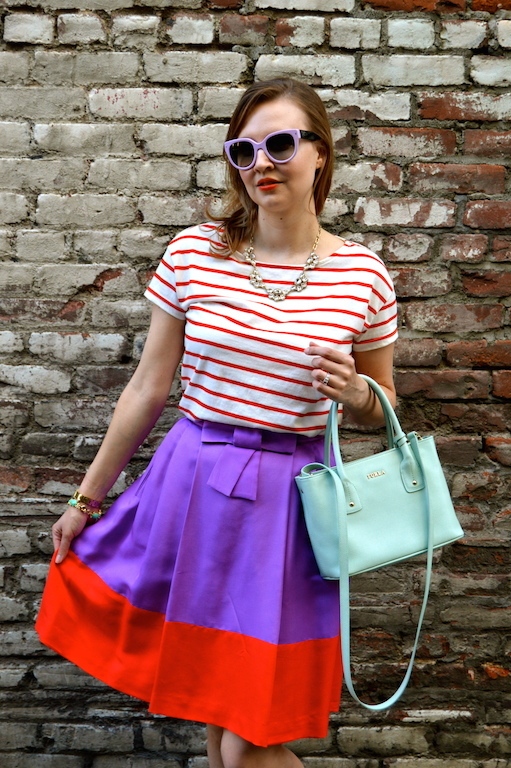 This skirt is amazing - great colors together and adorable bow detail. It looks great with your striped top and denim. Happy Blogiversary! 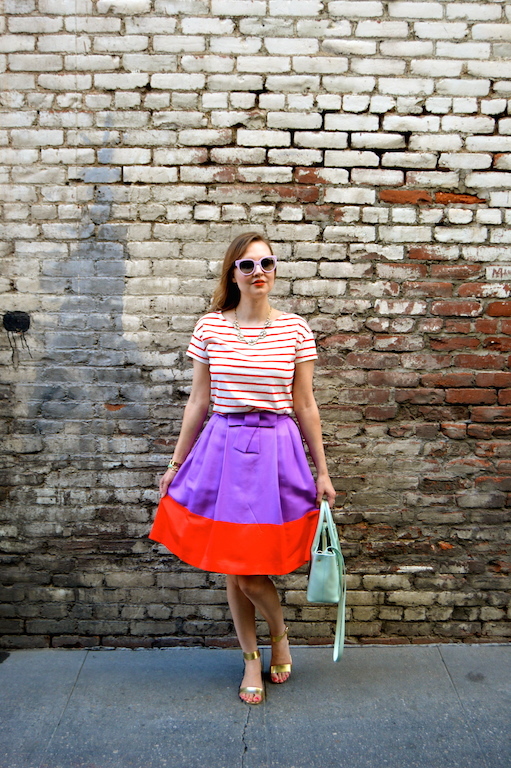 I think celebrating with an homage to a favorite skirt is brilliant. And such a fabulous skirt it is! goodness the years fly by the older we get! You certainly don't look like a gal in her 30s, let alone her mid-30s! Happy Blogaversary, Katie! 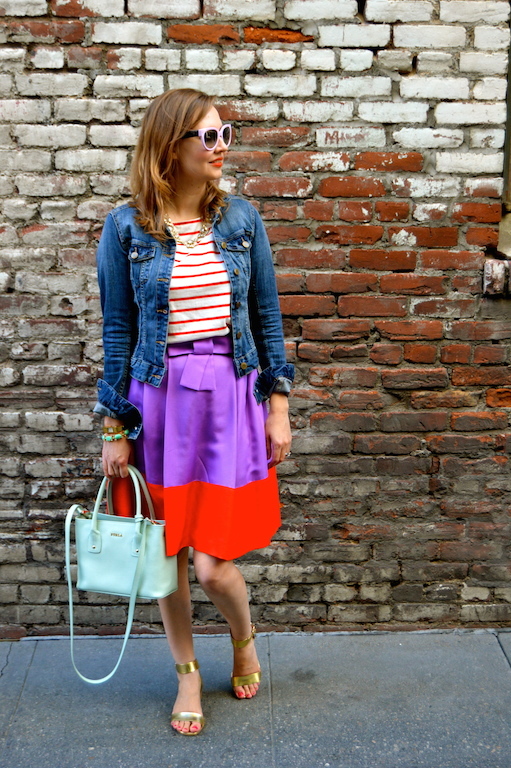 Love your style and your blog ... and that skirt! 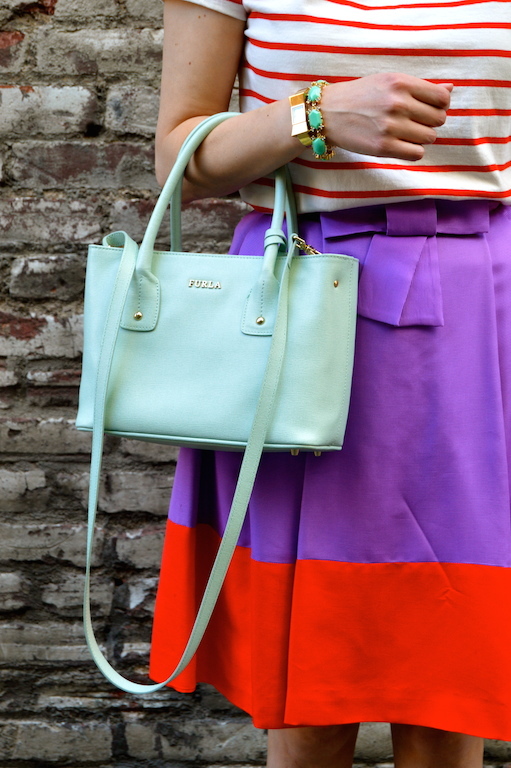 Thanks for sharing with Fun Fashion Friday! Happy Blogaversary. Five - that's impressive. Here's to five more! 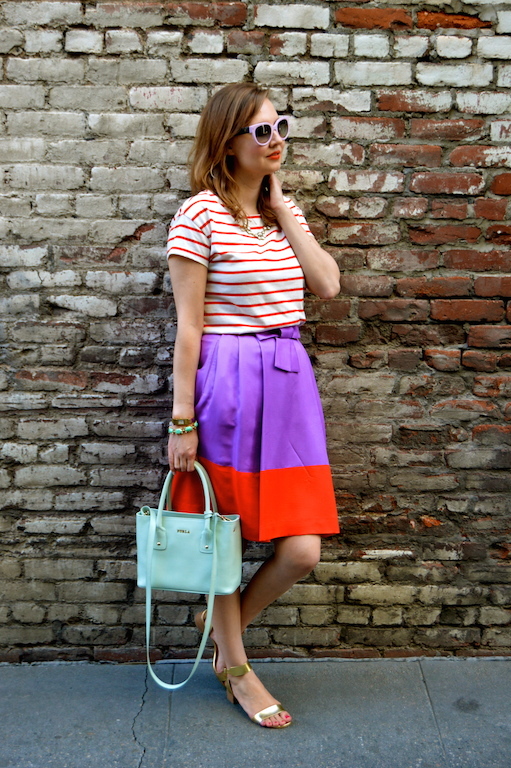 I think it's rather appropriate to showcase a skirt from the year you started blogging. And I love the red and purple together.